2. I go red in the face extremely easily. Not the attractive I've-just-been-doing-some-aerobics-please-admire-my-healthy-glow sort of red, I'm talking the full on I've-just-run-six-marathons-in-a-row-please-admire-my-tomato-face sort of red. 3. I'm not Billy Blanks' hugest fan. While I was living in Norway, I met extra special friend number 2 - a Romanian girl named Raluca. Raluca is super fit. She looks like she's really strong too. Overall she just looks so pretty and healthy that one day I made her tell me her secret. It was Billy Blanks' tae bo. Given that I sometimes need help picking up my shopping bags, I figured it wouldn't hurt to gain a little bit of muscle and tone. Big mistake. It did hurt, a lot. Don't ever think that you can keep up with this guy. He cannot be human, he must be some kind of machine. Seriously. Do you like to do workout DVDs? I think I prefer running around outside, but I guess this type of exercise can be pretty funny if you do it with friends! I used to do the half hour Tae Bo beginner tape every morning before work for several months, in about 2001 or 2002. Then I realized that 1. I wasn't losing weight and 2. I'd rather stay in bed. I liked it and it was fun but I grew tired of it and the shots of the hot model girls effortlessly doing the routines while I was dying of asthma and sweating like a pig. Haha aww, I kind of feel the same. I'm not trying to lose weight, I'd just like to exchange a little fat for a little muscle :) I haven't tried it again yet, I'd rather be lazy than have sore, aching muscles! Hehe it is hard! I tried to do a cartwheel quite recently, we are not as limber as we once were! 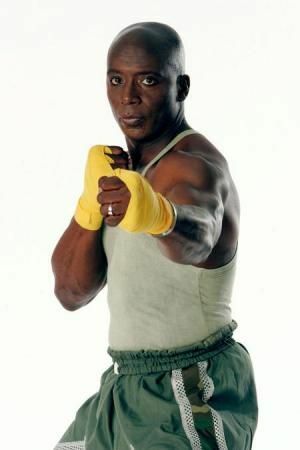 I love Tae bo! I have about nine of the videos. I even got Tae Bo for kids for my son. It gets easier--you just have to do it a few more times! I'm super uncoordinated and always go the wrong direction in step aerobics and stuff so I know it's doable. Billy Blanks is one of the few celebrities I actually would really love to meet--he seems so loving and inspirational! Hmm, maybe I will grow to love Billy Blanks. Only if he turns me into one of the girls in the video! I'm impressed you do so much, it's encouraging to hear that it gets easier! I have two left feet! I do an exercise video at my gym (no, we do not have in person human instructors!). I can really work up a sweat. i hope your days are beautiful, love. It can be funny running around oiutside if you're naked too. I think the fact that I go super red too (was so embarrassing at school) has made me so reluctant to exercise!